The Union of Youth Federations in Cambodia wants to see the Kingdom become famous by breaking world records. UYFC president Hun Many said during the closing of a congress in Phnom Penh yesterday that the group’s achievements were realised through hard work. “Everything that the UYFC does is for Cambodia’s destiny,” Mr Many said, noting that over the past six years the UYFC has broken four world records for the world’s longest krama, the world’s longest dragon boat, the largest Madison dance and the world’s heaviest rice cake. He added that the UYFC is encouraging Cambodian youths to volunteer with the UYFC to help shape the country’s future. Mr Many said UYFC members must continue to make the nation known despite criticism from some who said that breaking world records is a waste of money. During the event, Mr Many appealed to about 120,000 members nationwide to share the spirit of the Kampuchea United Front for National Salvation and the government’s win-win policy. “I appeal to all members to continue to maintain and disseminate the spirit of our December 2,” he said. Huy Vannak, UYFC spokesman, said yesterday that during its two-day congress, the organisation reflected upon its own achievements. During the closing ceremony, Prime Minister Hun Sen told UYFC members that the world records could not have been broken without the participation of youths. 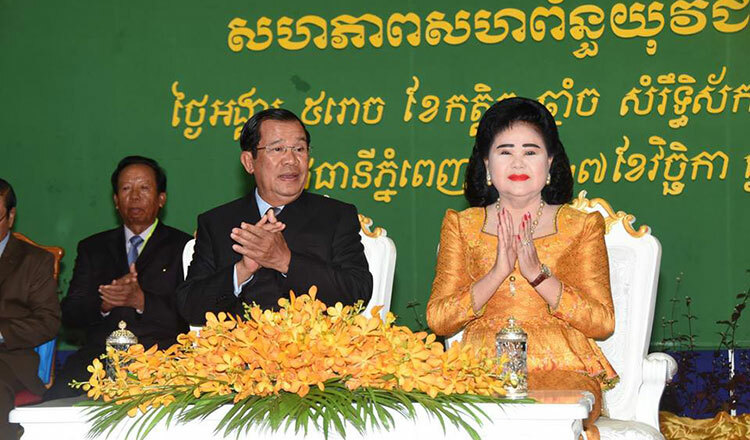 “All victories and all achievements were done by the participation of our youths here at the UYFC,” Mr Hun Sen said. During the congress, the UYFC also appointed 15 new members to its standing central committee, including Koh Kong Governor Mithona Phouthorng, Rattanakkiri Governor Thang Savun, Kratie Governor Var Thorn, Stung Treng Governor Mom Saroeun, Preah Vihear Governor Un Chanda, and secretary of state at the Interior Ministry Huy Vannak.